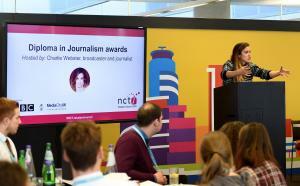 Journalism student Sam Blacklock represented Teesside University at the annual NCTJ student conference held in Media City, Salford. 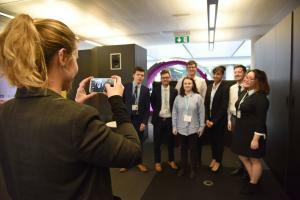 The event which provides a forum for students from across NCTJ accredited courses gives students the chance to share their thoughts on what they think of the NCTJ training scheme and to share information and ideas between students from across the country. The conference welcomed a wide range of guests from industry who discussed their careers and how the NCTJ was beneficial to them when securing jobs upon graduating from university. NCTJ Chief Executive, Joanne Butcher opened the event being joined by Amanda Bell (NCTJ principal examiner), Rachel Manby (Head of quality and assessment) and Emma Robinson (NCTJ accreditation manager) who opened the floor to questions on what students thought about NCTJ exams and assessments. Followed by a group session with students who went over what is good and what could be better about NCTJ courses. 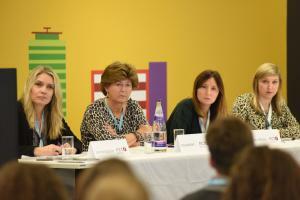 Broadcaster and journalist Charlie Webster attended the event to give students advice on breaking into the industry and why being a journalist is such an important role, she said: “You can change people’s perceptions and behaviours, for me that was the most important thing. “For me, journalism is about affecting people’s lives. “That’s exactly what I want to do. It’s about that passion and purpose, find out what you are passionate about and keep your individualism. “I’m from a working class background, which means I can go and speak to people, with empathy. I used to think it was a negative, but actually I can connect with people and people will connect with me. Third year BA Hons Sports Journalism student Sam Blacklock, said: “I absolutely loved having the chance to represent Teesside at the NCTJ student conference, having the opportunity to listen to successful journalists about their careers and what advice they have for us students is really important.